Stinging in his ear most of us have experienced in childhood. Most are sharp stinging somewhere inside the ear, sometimes even radiate to the surroundings ear. The first reason is offered otitis media. It is more common in children, the Eustachian tube connects the middle ear cavity with the nasopharynx is shorter, wider and its location allows easy transfer of inflammation of the throat to the middle ear. 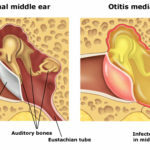 Otitis media is not exception even in adults, which is often difficult and uncomfortable waveform. If the child is unbearably stings in the ear, and it may happen that you wake up because of the middle of the night, there is no other help than to take him to the emergency room, where tiny puncture the eardrum to release the inflammatory focus and the pain is relieved. For an adult, it is possible to consider how much pain is acute, sometimes the pain is caused by inflammation and help, for example, a cold compress. “Home helathcare advice” often report that on pins and needles in the ear helps to garlic or onions. But the doctors with these procedures usually disagree.Anything inserted into the external auditory canal there could just get stuck and cause further complications. The true cause and treatment of stinging in the ear reveals to the doctor who examines your ear.